Dr. Jodi Rowley, the remarkable amphibian researcher ADM Capital Foundation has supported over the past three years, has named a new species of Frog after ADM ‘s Robert Appleby. Leptolalax applebyi or, to us, Appleby’s Asian Litter Toad, is the new addition. Story here: http://bit.ly/crM0Kz. Rob is thrilled but unsure about the resemblance! The frog, which Dr. Rowley actually discovered in the central Vietnam highlands in 2007 was officially recognized in Zootaxa late last year. A frog naming party featuring the glamorous Dr. Rowley was held Thursday night in Hong Kong. 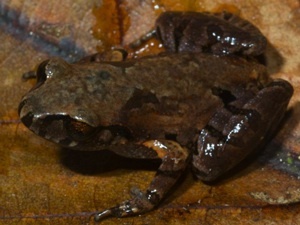 The brown frog, about 2 cms long, was found from its cricket-like call hiding under leaves on the forest floor. According to Dr. Rowley, finding new species of vertebrates is relatively rare these days. One-third of all frog species globally are threatened and one-half are experiencing population declines, according to Jodi. There is a certain urgency to identifying and studying these remarkable creatures before it is too late. Why do we particularly care about frogs, you might ask? Frogs are considered ‘canaries in the coal mine’, among the first indicators of environmental health, the first organisms to respond to change. Jodi has been mapping frog populations in the Indo-Burma corridor to set baselines. We need to know what’s there, what’s healthy and what’s not to track, for example, the effects of climate change on biodiversity. Currently, the Indo-Burma region represents an area of high amphibian diversity, intense human pressure and relatively little information on the status of the species or their conservation. Besides mapping local amphibian populations, Jodi mentors and teaches at universities in Vietnam and Cambodia, working to help train local early-career conservationists. Jodi has written in Zootaxa that she chose to honour Mr. Appleby, as “an investor in biodiversity conservation and scientific capacity building in Asia.” Beyond providing Jodi with key support (paying her harder-to-raise salary costs rather than providing the easier-to-raise trip and research funding), ADMCF has helped build the masters in conservation science program at the Royal University of Phnom Penh where Jodi has worked. We have also established a fund at Oxford University to send a graduate student to Cambodia each year to further their own research and at the same time to mentor and teach locally. Building the local conservation communities in places like Cambodia and Vietnam is crucial if we are to understand and protect biodiversity. Speaking of amphibians, Jodi’s photos of some frog species from the region are remarkable. I had no idea: One grows a collar of black spikes during mating season, while another grows hooks on its feet to disembowel competing males! Others are just plain beautiful. I guess it’s worth the leaches, the all-night frog hunting in jungle highlands for weeks on end, the Scrub Typhus that 29-year-old Jodi endures to find these creatures!